welcome to my brain . net: I'll just out-crazy your crazy! I'll just out-crazy your crazy! When your child has hit you, bit you, had to be restrained, was asked to stay outside to cool down then crawled back in a window, locked themselves in the bathroom, thrown something through one of the windows, ripped up some of your garden, etc., etc. ... what is a Mom to do? No, I didn't ask "What does a Mom WANT to do?" While this question would bring much more interesting answers, it's not quite what I'm looking for. Here is what I did. First, at the advice and aid of our therapist, we offered my child some melatonin to help calm them down. They were getting nowhere hurting me, and was probably about to self harm if things continued to escalate. Then, we joined my child in an activity outside to keep them moving and give them some fresh air. Then, of course, I left my husband with all the kids and drove to Braum's just as quickly as possible. At this point, if you are smart, you order a giant cup of something very creamy and sweet and chase it down with your favorite beverage. You read a book or listen to the radio. You roll down the windows and enjoy the AMAZING night, and another gorgeous Oklahoma sunset. Finish off with a long drive, listening to some encouraging CD's on all the things your child needs from you. You focus on the good, and the things you love about them (having to dig deep, I know, on those rough days of big feelings). Self-care. Putting on your oxygen mask first. 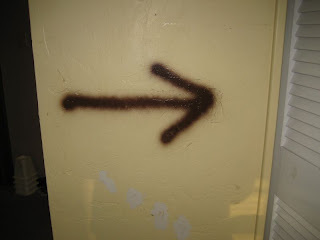 You come home to the child who hit you, bit you, needed restraint, was asked to stay outside then crawled back in a window, locked themselves in the bathroom, threw something through one of the windows, ripped up some of your garden, etc., etc.. You enter their room with a can of spray paint and a bag of candy. 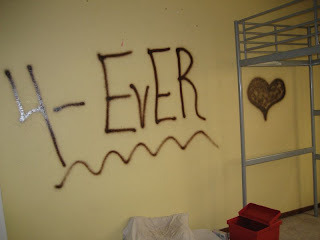 You step over the posters and notes you've made for them over the past year (now lying all over the floor torn to shreds), and you just spray paint your love notes directly on the walls. You turn around periodically to watch your child quickly hide their expression of "WTH??" Then you plop down on their mattress and ask them to join you. You start popping candy into their mouth as you talk to them and sing to them. You tell them those positive thoughts you were thinking on the way home. You tell them the good you see in them (even though it's hard to remember any of it on these days). You tell them a story. You sing to them. You cuddle and stroke their hair (even the puff sticking straight up because they took out one of their braids in anger during the day ... and you know they're now really regretting it). Then, you kiss them goodnight. They actually ask you to lean back down so they can kiss your cheek. You tuck them in and turn out the light. You shut the door to set the alarm. You out-shine the darkness. You out-love the fear and anger. You out-crazy the crazy. And then you cry. Hard. Yet I again I am so proud of you. Gonna get me a can of spray paint. You're amazing! 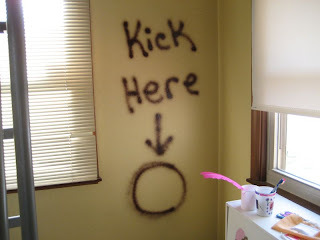 I wouldn't have the guts to spray paint my walls. May you be blessed with a settled weekend and the opportunity to find at least a little peace. Wow! That definitely out-crazies her crazy. Keep up the awesome work!! Christine you rock my socks off! 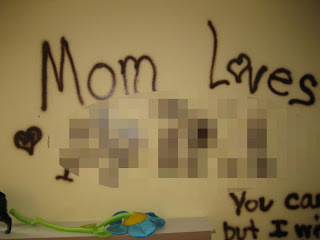 You are amazingly creative and I admire you for seeing more in your children than their behaviors. I'm going to tweet this post. I have tears in my eyes from reading this post. I wish all children, scratch that, all people could have that kind of love and devotion. Mar Mar is lucky to be your daughter and I am lucky to have stumbled across your blog. You inspire me all the time to be a better mother. Thank you!! Thank you!! Thank you!! ...and hugs and prayers to you and your family! You are an AWESOME mom Christine! You encourage me so much. I can't even explain what a blessing you have been. I've been reading your blog for some time now and every new post I read of what you do just amazes me anew. The way you choose to love your kids, no matter what, is just so beautiful. I pray that many miracles come your way and that God continues to give you the strength and courage and creativity you need. What a great post and what a wonderful idea to stash in my brain for the time it's needed! Love it. You know she's going to kick every spot but that one right? ;) (trying to be funny...doesn't often work for me, but I try.) Love it. Smart woman you are!! 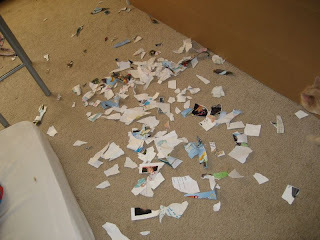 I would have been very hurt to see my love notes torn up like that. Not surpised...but hurt. Make sure you care for those wounds eh? Gonna have to link this one to my blog. Loved it. Can you come to my house today???? Whew...we've only just begun! Wow. I will definitely remember this post when I'm working with my foster/adoptive parents... Excellent. I love you John Locke. I'll take that as your apology. wow! wow! wow! I so don't look forward to the violent days (if we get there) but I am SO glad I have found you to learn how to be such an awesome mom!! You are amazing, Christine. God definitely knew what he was doing when he created you. I just came across this through a BlogHer link--never gone to one ever before. I was diagnosed RAD. Between then and now, a lot of bad stuff happened... I made a lot of bad decisions and hurt a lot of people and got myself into a lot of hot water. But now, I'm happily married and a stay-at-home mom with 2 beautiful kids. I'm calm and I'm content. And my biggest stressor today is that my in-laws are coming over for Easter on Sunday and the house isn't clean. Rock on Christine. You da bomb! I am completely in awe. Christine-- thank you for continuing to challenge all of us to think outside of the box when it comes to our mission of love, mercy and selflessness. 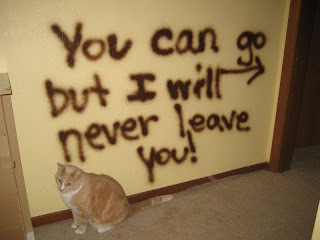 And can I say how much I love that last picture with the cat it in? I wouldn't be surprised if she was sitting there before, during and after the spray paint. She's got this, "Yeah, I live here and this kinda stuff happens all the time," look on her face. You could totally do a "Capture this Picture" contest on your blog with that one. Thanks for bearing your soul to us. I have said it before and I say it again...WOW!!!! I admire you for your stick-to-it-ive-ness!! (If there is such a word!) You are amazing and you are doing an amazing job of showing God's love. Unfortunatly, 2 of your babies have not seen that in adults probably their entire lives and they don't know what to do with it. They think you will go...like all the others...how sad that they cannot trust adults. But they will, Christine, they will. Hang in there...cry out to God...He will the Mar's deliverer! My prayers continue for you and your family! I'm loving you right now. Big time. Yeowza, you make me want to adopt and you make me desperately want to run screaming the other way at the same time. You out- crazy the crazy. Perfect! You just rocked my world with this post. This is just positively AWESOME!!! I'm reading your entire blog backwards and just had to stop here and say: WAY TO GO!!! I'm just getting to this...so glad you link to your older posts. This is just. Totally. Awesome. I did a search of your therapeutic parenting posts and am loving, loving, loving reading my way through them. You are an amazing mum! !